Duct Work with Advanced Aire Flow Inc. Whether you are buying a new home, fixing up a home you purchased or renovating the home your live in, Advanced Aire Flow wants to be your answer to providing comfort and energy efficiency in your home. As much as half of the energy used in your entire home will go to heating and cooling. This is why it is so important to make your home's heating, cooling and ventilating system as efficient as possible. It has a big effect on your comfort and perhaps an even bigger effect on your utility bills. Ductwork that is corroded from years of use –or poorly installed ductwork can cause your utility bills to much higher than they need to be all the while rendering your heat or air conditioner system to be inefficient. So while you may have your furnace or air conditioner running well, the fault may be in your ductwork. If you need new ductwork for your system, trust Advanced Aire Flow to inspect, determine any impediment, fix what needs to be fixed, and test to make sure you are getting the maximum from your HVAC system. 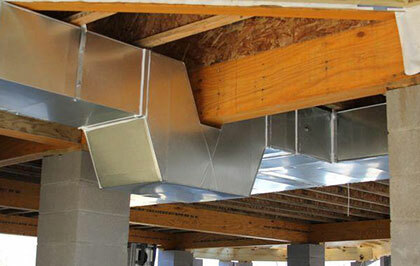 Quality ductwork is essential to distributing heat and cool air efficiently throughout homes and buildings. Just as your car can benefit and improve gas mileage from a yearly tune up, your heating and cooling system can improve efficiency and efficiently run heating and cooling translates to comfort. Proper maintenance of the ductwork in your home can keep the entire system functioning at peak levels for years. We will inspect your entire duct system – even the hard to get at places. We welcome the opportunity to work with you. Advanced Aire Flow is committed to customer satisfaction. So whether you need our services for your home or business, you can can count on us to get the job done. See the contact page for more information or to schedule an estimate.